Firstwellness English Academy of FEA is housed at Verbena Capitol Suites specifically at Don Gil Garcia Extension, Capitol Site, Cebu City. On the map above, we can see that Verbena is situated at the heart of the city. Yes it is very convenient place to stay. It is very near to malls — the nearest mall is Robinson Mall where it takes only for 10 minutes on foot because I walk slowly and I am short. But if you walk fast, you can reach the mall in 5 minutes. Ayala Malls takes 10 – 15 minutes by jeepney or taxi. Two blocks away from Verbena Suites is Chong Hua Hospital. This is one of the best hospitals in Cebu which is internationally accredited. It takes 2-3 minutes by taxi. The plug down rate is 40 pesos so from Verbena to Chonghua maybe you will have to only pay 47.50 pesos. That near! Another neared hospital is Cebu Doctors Hospital which also a very good hospital (Chong Hua and Cebu Doctors are considered the best hospitals in Cebu City) is located around Verbena Area. On the map above, I squared the location with the name “HOSPITAL”. 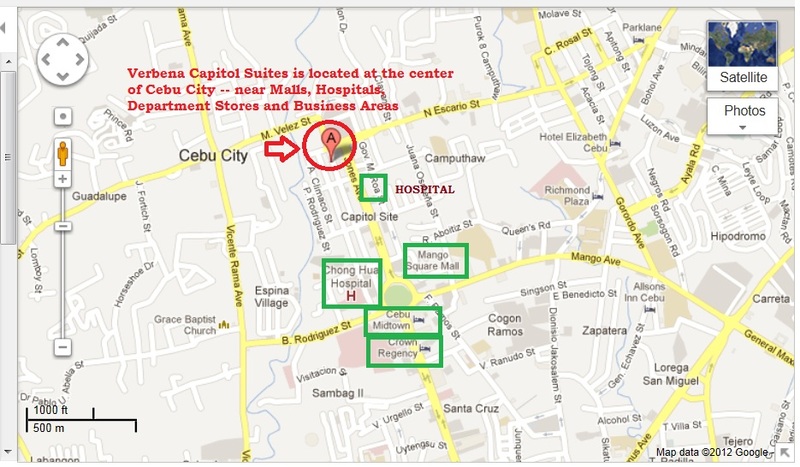 That is where Cebu Doctors Hospital is located. There are many banks around the area. The banks include – METRO BANK, BPI BANK, BDO, LAND BANK, RCBC and PNB. So monetary transaction here is quite easy. This place is also near Christian (Roman) Catholic Church. The nearest is Capitol Parish Church which takes about 5 minutes by taxi. You can pass this going to Ayala Mall. Mango Square an area where bars, clubs and restaurants are located. It is one area that is so alive at night! People who wants to party, drink, dance and simply have fun must not misss this place. Luckily, the place is just a few minutes away from Verbena Capitol Suites. It takes about 5 minutes by taxi or 10 minutes on foot. It’s near Robinson Mall. 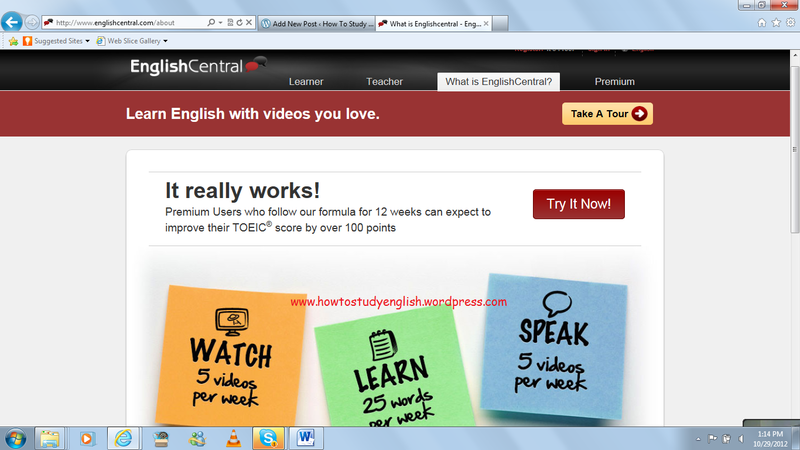 Studying in Cebu is so much fun but hat you must consider first before anything else is safety and convenience of life. For instance, when you need to buy food, shampoos, clothes — it isn’t so ideal to spend so much time on this. You can rather spend time on something else worthwhile. Staying at FEA can help you save time geographically. Everything you need is just next door. 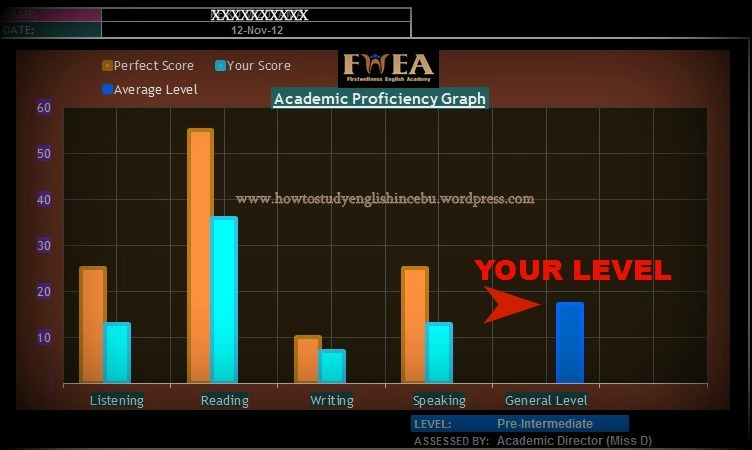 Now, FWEA academic system created a new visual method of the student’s English Proficiency Level which presents the perfect score of each part of the test — namely Listening, Reading, Writing and Speaking — correlating it with your own score. On the left side of the graph shows the average level of your test. Below is the level description which states the the sample level of the student is Pre-Intermediate. In addition, the name of the evaluator, Miss D (me) ^^ is placed because at times, when I am not around the next in rank can do the evaluation instead of me. The graph is given together with the final schedule of the student the next day. The student is instructed to show this to all teachers so teachers will also have an idea of their real English level before they start the lesson proper. Another copy remains at my office, (Academic Office) just in case teachers would want to refer in the future. If the student does not understad the proficiency graph and what it represents teachers can assist them in understanding the facts presented. I hope the through this factual graph, students would be enticed to level up since visually they now have a picture of where they are in English. Studying in foreign country can be at times lonely and well, sometimes it can really be boring too! That is why it is necessary to stay in a school where you can find comfort during your stay aside from the quality education you are looking for. Living in a school with a friendly environment can be so much help in your studying. Environment plays a vital role in learning. By this, I mean not just how big the classroom is, how comfortable the chair is or how big the building is. What I truly mean by comfort is if you can go along with people living the place. In the school I am currently directing, First Wellness English Academy so far the living conditions here are fairly nice. All Japanese students get along with each other well – whether they are newly arrived students or senior students that have been staying for months already. There seems to be no conflict at all. The respect each other’s privacy at the same time they go out all together for dinner and drinks. There is absolutely no overpowering of each other instead I can see students helping each other learn English and cope with loneliness. That’s something impressive about FWEA! Right now, we have on Mongolian student which is welcomed by all Japanese students. There is no discrimination of races, not a bit. Cool, huh? About a month ago, we also had Korean-Japanese students are he was treated fairly by all students. Teachers as well do not give impartial treatment to students. All students are friends with teachers. Whatever race you have, it doesn’t really matter in FWEA. It is also amazing how everybody can be friends in First Wellness English Academy. Age is just a number as they as say. The school proves it. We have students who are 61, 65 and late 50’s who goes out with younger students. There is indeed equality no doubt. Everybody can be a friend at FWEA. If you plan to study in Cebu, choose a school that can also be your HOME and you can lively with a smile.